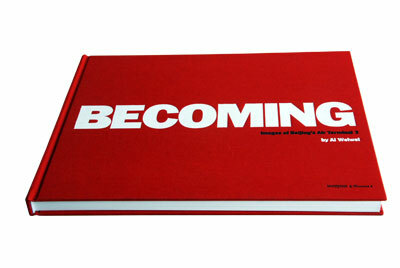 Becoming (Ivory Press/Timezone 8, 2008) is a book based on Ai Weiwei’s photos of the construction of Beijing Airport Terminal 3. It is tempting to portray Ai Weiwei and Norman Foster as a pair of polar opposites. Ai, on first inspection at least, couldn’t be more different. From his home/studio, which he built illegally on government-owned ground, based on a plan he’d drawn on a napkin, Ai Weiwei produces art, film, books, and buildings that inspire, amuse, and occasionally insult. His first show, exhibited in New York in ’83, consisted of a violin with a shovel handle for a neck, a pair of conjoined shoes, and a wire hanger bent into the profile of Marcel Duchamp, the artist who, along with Andy Warhol, provides Ai’s most explicit influences. While Foster has maintained a forward gaze for most of his career, exploring the possibilities of technology to deliver a better, more functional future, Ai is infamous for his deformation, duplication, and wanton destruction of technologies of the past. Both men have confronted Berlin’s Reichstag in their work, but where Foster gave the building a new identity, transforming a symbol of the city’s traumas into a manifesto on openness and sustainability, Ai, in his Study of Perspective, gives the Reichstag the finger. All of the above is true, but at the same time untrue. It is, to borrow one of Warhol’s phrases, “deeply superficial”. Despite their obvious differences, there are large areas of overlap between the approaches of Norman Foster and Ai Weiwei. For one, both men exhibit a fascination with large-scale, high-complexity projects. In the architect Foster’s case, this is seen in works like Chek Lap Kok, Hong Kong’s airport, a six-year venture that, in the words of critic Deyan Sudjic, “involved the building of two major suspension bridges, 34 kilometres of motorway, a mass transit rail system, the removal of a mountain, and the creation of an artificial island, even the assembly of a fleet of ships to take the workforce to and from the site.” In his capacity as an artist, Ai has produced work of similar ambition and organizational rigor. For Documenta 2007, for instance, he created a living exhibit that involved transporting 1,001 Chinese people to Kassel, outfitting them with matching clothes and luggage, housing them on bamboo bunks in Ai-designed temporary quarters inside an old textile factory, then setting them off to roam the streets of the host city for the three-month duration of the show. Not surprisingly, efforts like these have given Ai and Foster reputations as men inclined toward attention-grabbing gestures. Showy, Hollywood-ready landmarks like Foster’s Swiss Re building in London and controversy plays like Ai’s Dropping a Han Dynasty Urn dominate the public’s perception, blocking out their creators’ subtler, more fundamental qualities. 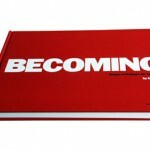 Becoming is an opportunity to change the focus. The images presented here offer a view to what is, for me, the essential commonality among these two seeming opposites, their passionate commitment to craftsmanship and detail. It is a quality that imbues even their most blatant works with layers of hidden depth, and which, perhaps, explains how a book like this came about. Throughout their careers, Ai Weiwei and Norman Foster have applied a working method based on careful study and commitment to craft. Even in works like Slanted Table and Table with Three Legs, where he deforms Qing Dynasty furniture, rendering it absurd and useless, Ai is resolute in his faithfulness to historical construction techniques. The architecture of Foster is often described as high tech, but also shows strong affinities with the English Arts and Crafts tradition, particularly its emphasis on connecting design and fabrication. It is a commitment that extends to the most seemingly trivial aspects of Foster’s designs, as seen in the architect’s well-documented quest to design the perfect doorknob. 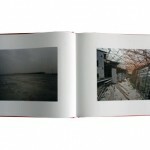 The photos presented in Becoming showcase this shared fascination. They do not strive for completeness; they don’t explain or adulate. Instead they examine, taking a curious, educated eye to the inner workings of a building that hundreds of millions will use, but few will ever understand. In the process they subtly show the relation between artists with different eyes, but similar hands. What is most striking about Ai’s photos of Foster’s new terminal for Beijing Capital Airport is the sense of order and calm that they evoke. For the work of a supposed prankster, the images are surprisingly straightforward. 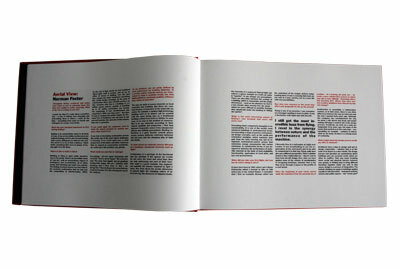 Though they apply techniques associated with art photography – large format, short exposure, high depth of field – many have the simple qualities of a snap shot. Often, the photos impress with what they do not show – namely, people. Terminal Three, as the new airport is more formally known, is the largest covered structure ever built, a monument to China’s greatest free market virtues – scale, speed, and cost. As is widely reported in the British press, it is about twice the size, half the cost, and planned and built in almost a third of the time of Heathrow’s Terminal 5. There are dozens of other startling statistics that can be rattled off in regards to the airport, but for the purpose of this book, the most pressing is this: it’s estimated that at its peak the airport’s construction required a workforce of 50,000. Strange then that Ai Weiwei’s photos, taken at various points during the construction, are virtually worker-free. One might expect a hive of activity, workers clamoring over each other, or perhaps the construction equivalent of the coordinated human pixels at a North Korean sporting event. But Ai’s photos appear serene, almost melancholic. 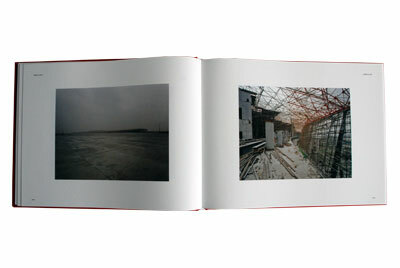 Flipping through page after page of empty, majestic spaces, one gets the sense of being in the eye of a hurricane, witnessing the last moments of tranquility for a patch of earth soon to be turned upside down. For most of the photos, the terminal is skeletal. Its most dramatic qualities – the light and airy glass walls, the high ceiling, the descending walkways and russet roof – are obscured. It is an impressive form without a recognizable personality. In this gestating state, it seems the building could develop to become almost anything: a space ship, a giant turtle, a ski ramp, a music video set, a greenhouse, a jungle gym… As the construction progresses, it becomes interesting to guess which potentialities will be highlighted, and which will disappear – what views will be lost, what spaces dissected, how the infinite possibilities of wide openness will eventually give way to the rigidity that guarantees an airport’s efficient operation. The authors removed, we are left with no choice but to consider the consequences of their work. Then, suddenly, the undeniable airport interior: the reflective floor, the grey spatial dividers, the silver travelators and hanging atmosphere of short-term urgency. What once appeared desolate now delivers touches of the sublime: sun rays beam through vast, unobstructed windows and are extended via metallic ribbons along the ceiling. Sunlight generally soothes buildings, but in Foster’s terminal its presence is triumphant, almost euphoric. With completion, the tension between new and used disappears. There is no more sagging canvas or frayed rope to be seen, only gleaming tiles, immaculate, interwoven steel, smudge-free glass, and occasional bursts of PRC red. In the absence of old, a new tension emerges, precisely the kind that has been avoided until now: the building now contains specks of humanity, and Ai’s large format images capture the startling juxtaposition between the building’s epic scale and the smallness of its users. As their movements come to dominate more and more of the frame, it becomes clear that we have arrived at the end, and the terminal at its beginning.